There are several fields in Yeovil called Drang - this, one of two close to Little Lyde Farm, one in New Town (Parcel 994) and a further example off Lower Larkhill Lane. FT Elworthy in his "West Somerset Word Book" records that 'Drang-Way' was a passage or narrow alley, invariably between two walls, while FW Matthews in his "Glossary of the West Somerset Dialect" recorded that Drang, or Drong, was a narrow way between high hedges or walls or earth banks. The word is probably a British survival of the Welsh dre meaning a street or road. This particular Drang (Parcel 866) was a field access track leading off Meadway (today's Lyde Road) although it was much larger than most access fields of its type. 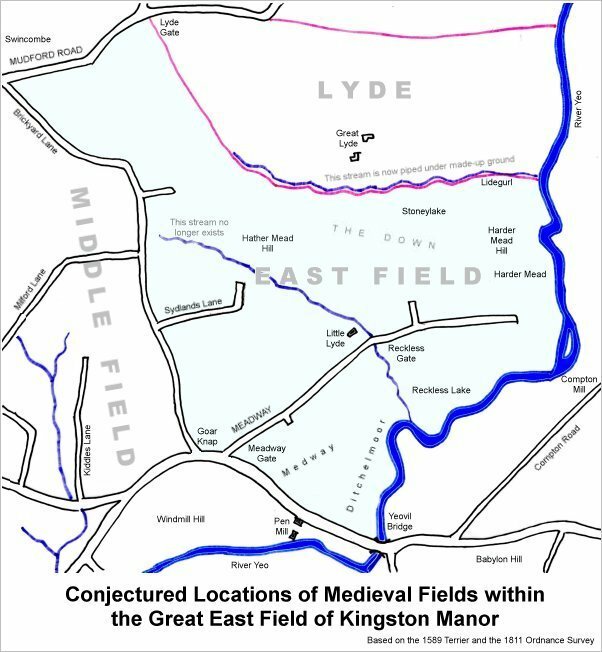 It had once been part of the great Medieval East Field of Kingston Manor. 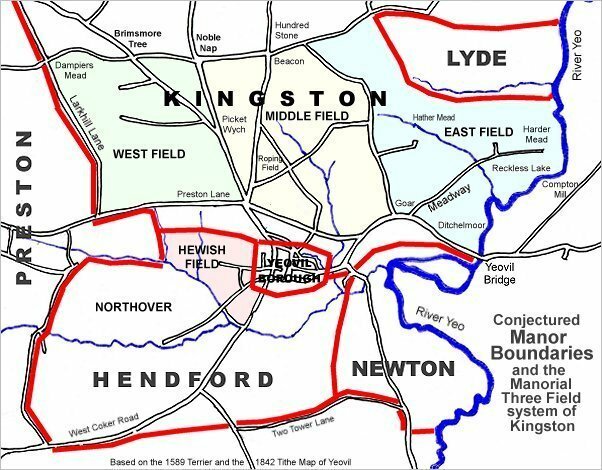 The 1846 Tithe Apportionment noted that Drang was owned by William Jones Prowse (Lord of Kingston Manor at that time) and the tenant was Thomas Frost. The Apportionment noted that it was used as meadow and measured 2a 3r 6p. A Counterpart of Lease for seven years dated 25 March 1859 between Captain William Prowse of Enham House, Southampton, Retired Captain RN, and John Stone of Pen Mill Inn for both the inn and the adjoining farm, included Drang (Parcel 871). The lease noted that the field was used as pasture for grazing. Drang (Parcel 871) was part of Pen Mill Farm and was accessed on the northwest from Meadway (today's Lyde Road) and bounded on the southwest by Grubbins (Parcel 874) and Thistlemoor (Parcel 870). On the northeast it was bounded by a small brook which is no longer evident above ground and is, presumably, piped underground. An outbreak of smallpox in Yeovil during 1870 caused great concern over this serious, disfiguring and deadly disease even though the number of fatalities was relatively small. Some twenty years later a visitor to Yeovil brought the disease with her in February 1893, although in this instance the disease was contained. Nevertheless the Borough Council were concerned enough to commission and speedily erect an isolation hospital - on Drang, which was considered remote enough for effective isolation. The hospital was built in 1893 by Yeovil Borough Council with accommodation for a caretaker, his wife and four patients. Its first case was admitted in 1895 when a young lad from Exeter, visiting a house in Orchard Street, was diagnosed with smallpox. Fortunately the disease was contained and the boy eventually recovered. In June 1902 it was recommended that a wash house and mortuary be added to the complex and that infectious diseases other than smallpox should be treated there. The hospital was taken out of use in the early 1930s and during the Second World War served as a mortuary for air raid victims and as a hostel for 'difficult' evacuee children. The building was finally demolished in the 1960s and today the site is approximately halfway along Buckland Road, on the Pen Mill Trading Estate. 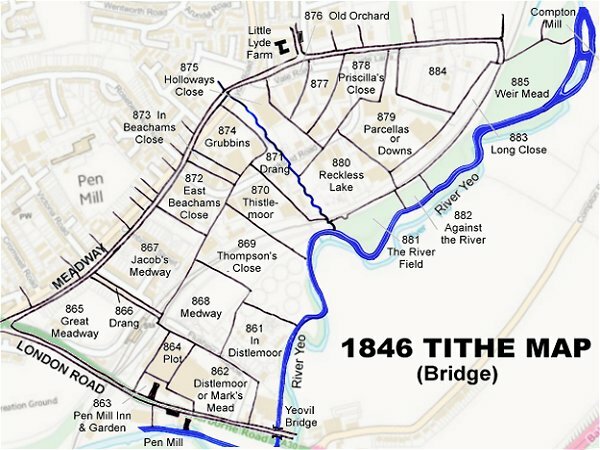 This map is based on the 1842 Tithe Map with field names chiefly added from the 1846 Tithe Apportionment. 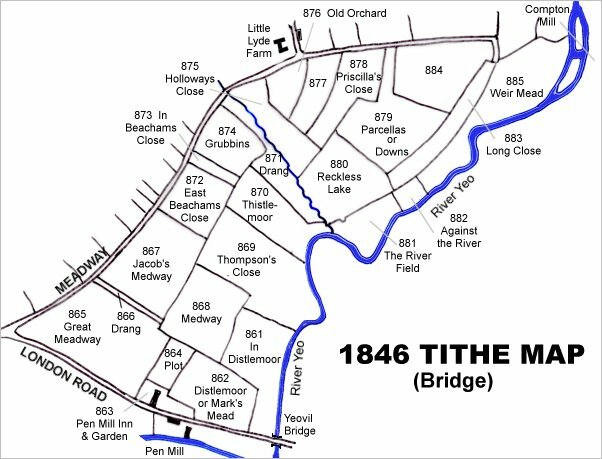 The 1842 Tithe Map superimposed (roughly) over a modern street map. Bearing in mind the relatively primitive surveying equipment of the 1840s they weren't all that far out. 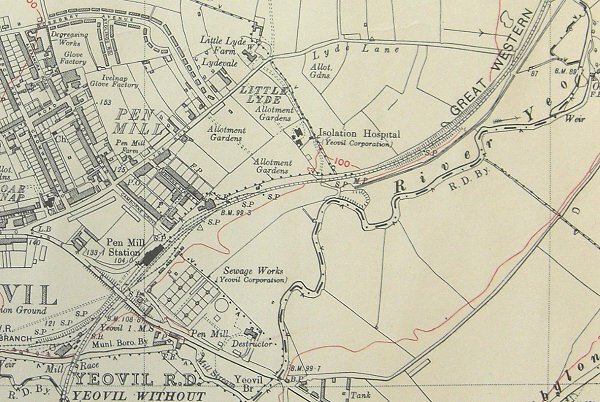 The 1927 Ordnance Survey showing the whole of the Pen Mill - Lyde Lane area with the isolation hospital in Drang at upper centre. A 1946 aerial photograph showing Little Lyde Farm in the top left corner with the track running south, along Drang, to the Isolation Hospital at lower centre. 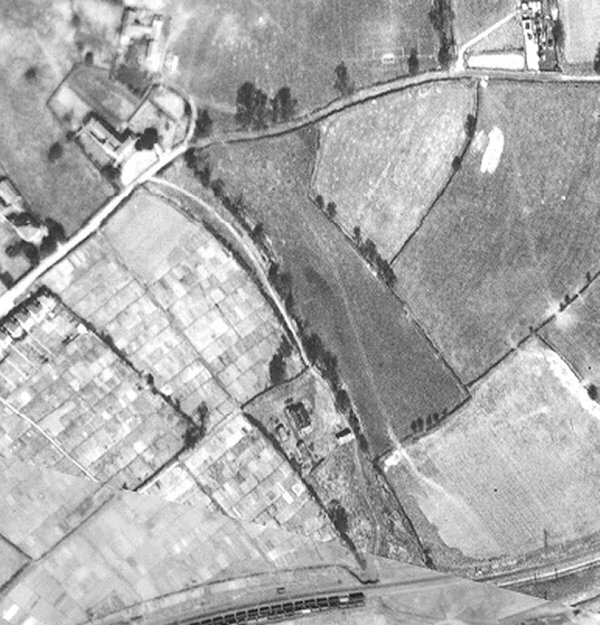 Note that Lyde Road is not built beyond the farm at this time, note also the huge expanse of allotments at lower left and also the train at bottom. 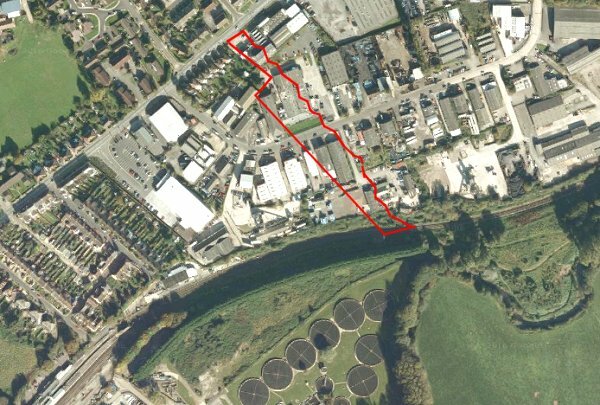 A modern aerial photograph 'borrowed' from Google Maps with the approximate boundaries of Drang (2) (Parcel 871) outlined in red.